Happy Hormones Slim Belly is a new weight loss program created by health expert and bestselling author, Jorge Cruise. This plan is scientifically designed to meet the unique needs of women over 40. Women over forty need to limit carbs to lose weight. Yet they also need to eat carbs to raise their levels of the “feel good” hormone, serotonin. Doing both at the same time is a challenge, which can be overcome with a technique called “carbohydrate cycling”. Jorge Cruise says this method balances your hormones so you can lose up to 7 pounds the first week, then 2 pounds a week thereafter. Happy Hormones Slim Belly refers to all carbohydrates as “sugar calories”. This is because they are eventually broken down into glucose at a molecular level. The basic weekly Happy Hormones Slim Belly diet plan consists of two “slim days” and five “happy days”, which have varying amounts of sugar calories. “Slim days” consist of a very low carbohydrate diet. “Happy days” allow for greater variety and a higher intake of carbs. Alternating between low and moderate intakes of sugar calories reduces the negative effects of carbs by reseting your sensitivity to insulin. Research showed that by cutting sugar calories for just two days of the week, women were able to recalibrate their bodies. On this plan they lost nearly twice as much body fat compared to following a calorie-restricted diet all week. When insulin sensitivity is improved, women are able to add some carbs back into their diet without gaining weight. Additionally the five “happy days” will feed serotonin receptors, which tend to become inefficient on most low-calorie diets. Happy Hormones Slim Belly also offers two variations on the basic program. These can be adopted at any time according to your personal preferences and goals. On this variation you limit your intake of sugar calories to 100, every day of the week. It is designed for maximum weight loss and should be implemented only when you are feeling super-motivated. You can eat up to 500 sugar calories for all seven days of the week and you will still lose weight. It will just occur at a slower rate than on the general plan. Happy Hormones Slim Belly recommends these foods. Tuna, shrimp, chicken, turkey, bacon, steak, egg, string cheese, goat cheese, yogurt, half-and-half, sunflower seeds, pumpkin seeds, peanuts, oatmeal, rice, bread, kale, lettuce, spinach, zucchini, sweet potato, tomato, cauliflower, asparagus, peppers, avocado, butter, olive oil, dark chocolate. Happy Hormones Slim Belly says you can double your level of serotonin, boost your hormones, and release feel-good endorphins almost immediately with the recommended workout. They can all be completed in a 20-minute workout. You can also take a short walk before doing them for better results. 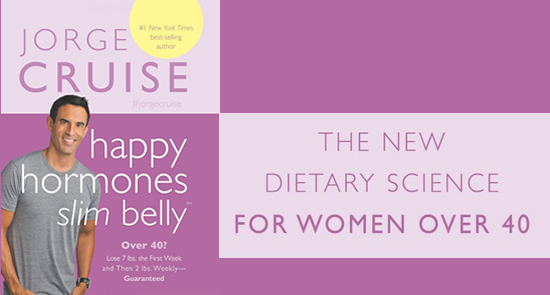 Happy Hormones Slim Belly: Over 40? Lose 7 lbs. the First Week, and Then 2 lbs. Weekly—Guaranteed retails at $19.95. There is also an option to join the Happy Hormones Weekly Menu Club online for $9 a month. Happy Hormones Slim Belly is specifically designed to meet the needs of women over 40. May control carbohydrate cravings by balancing serotonin levels. Only need to strictly limit carbs for two days each week. Workout is time-efficient only requiring 20-minutes each day. Requires counting and limiting your intake of carbohydrates or “sugar calories”. Happy Hormones Slim Belly encourages unrealistic weight loss expectations. Necessary to prepare most of your own meals. Alcohol is not permitted at all on this plan, however you can have a glass of red wine on special occasions if you like. Happy Hormones Slim Belly consists of two days of strict dieting followed by five days of more flexible eating. This method can improve insulin sensitivity and boost serotonin to avoid cravings and enhance fat-burning for women over 40, however, women should keep their expectations in check and shoot for slow and steady weight loss.